IHG Rewards Club (the Holiday Inn, HI Express, Crowne Plaza, InterContinental etc group) has just published its new list of heavily discounted PointBreaks redemptions. You can book these hotels for stays until 28th February. These hotels are bookable NOW via ihg.com. Popular hotels will use up their allocation of reduced price rooms quickly, so book soon if you are interested. As with all IHG Rewards Club reward nights, you can cancel without penalty at any time and get your points back. Historically all PointBreaks rooms cost a flat 5,000 IHG Rewards Club points per night. This was a great deal, except for the teeny tiny fact that the selection of hotels had been getting progressively worse for the last couple of years. If you were looking for a good deal in a major tourist centre then you were going to be disappointed – although it was handy if you wanted a weekend break in Doncaster. This has now changed. The 108 hotels on the list below are priced at between 5,000 and 15,000 IHG Rewards Club points per night. In general the quality of hotels included has gone up since the 5,000 point cap was removed, although at the end of the day it always depends on how the list fits around your travel plans. Not surprisingly the better deals are at the 15,000 points level. PointBreaks availability is limited so book ASAP if you are interested. You can book via the IHG PointBreaks page here or via the standard booking page here. 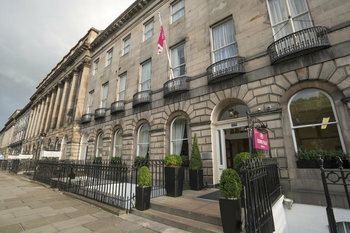 You are able to book these hotels for dates up to 28th February. You allowed a maximum of two bookings per individual hotel. Each booking can be for as many nights as you want. Remember that if you attempt to amend your booking later by dropping a night or two the whole booking may reprice at the full rate. Purely to boast, I’ve had a right result! Yesterday, I was due to book a February weekend away at the Liverpool docks Holiday Inn Express for £240 for 2 nights – but decided to hold off for the list. Perfect, in Brussels wed to Friday with work and finish it off with Antwerp for the weekend 15k a night instead of 194 euros. Thank you! [email protected] Rob: using chrome across three devices. No problems so far as I can tell. OT: How long does points from IHG Creation card to your Creation account take? My bill date was 21 Nov and it still has not posted. Same for me too. Normally post on statement date, but not received this month’s yet. If December points are late posting I could fall short of hitting Spire threshold. I registered for the card in August this year and so far no points have been transferred to me! I have contacted via the website but there has no reply after over a week. Looks like I will have to call them. Mine tend to appear in my IHG account within 24 hours of statement posting. I had my points last week as expected. Not the case for many of us this month (was the same in August). Hopefully will come through soon. Ours usually post within 48 hours but not always (including this month) & the t & c’s do say it can take up to 5 business days. Since IHG is predominantly a US company perhaps the Thanksgiving holiday last week is causing a delay or am I just being generous?! HH points are taking ages this month to migrate from the HH visa. Hilton website been even worse than usual recently, been taking over a week for points to post from stays. HH Points took over a week after the upgrade but two stays I had with Sunday and Monday checkout this weekend posted next day. Both less than 24 hours after checkout. Slightly OT, but I’ve been trying to get the Ambassador deal on the IHG website, but can’t get it to work. Tried several different credit cards, but the page just comes back without confirmation, and substituting my membership number for my credit card number. Anyone else having the same problem? Or a solution? Earlier in the year this was certainly a problem. I ended up calling them to renew. “only” 35k points normally, but still a good deal if you can get there at short notice! A little awkward to get to though, have to take a domestic connection or there are some limited flights from KL, Bangkok etc. I’ve heard the same. We went four years ago for a week when there were only a few choices for decent hotels. We had a great time just relaxing. The sights of the island can be seen in a day though – old prison, fish sauce factory, pick up some peppercorns – and food options not as good as rest of Vietnam. Still I’d like to go back. I went to phu Quoc in Feb this year (to the Marriott). Hotel was lovely but i don’t think I’ve ever been to a place less ready for tourism. Extremely difficult to find anywhere to eat out there as well, nice hotel but not my cup of tea. Just got back from 5 nights there at 35k points, which I was happy with. I agree 15k points a night is a bargain. Hotel is a little isolated as they are currently building all round there. But the facilities were fantastic, great rooftop bar, pool and beach. Would go back tomorrow at 15k a night. We’re headed to the Marriott Phu Quoc on Monday. Direct flights once a week from Gatwick on Tui. Am a little apprehensive given some negative comments on the island but the hotel sounds very special. Can you buy flight only on TUI which is not part of a package? Booked the dates we needed (minus one) last night. 6 nights for 90,000 IHG points. Bargain. Thanks Rob for highlighting. It is very soft, I had this discussion with Ritz Carlton when I was in Ras recently. I don’t wonder why. I have always refused to go there due to lack of humaj rights and respect for people with different religions, woman, LGBT people and so on. I know Rob and I have a different view on this. Whilst I don’t doubt your objections & their validity, there are many examples that show the real people of the countries we condemn (for their politicians) are actually normal, nice people just like us. Think about the fantastic PR coup of the Russian World Cup this year. Anybody who travelled there and met the locals had a brilliant time. White Russians (& I only say that because I don’t know much about the more Eastern Russians) are Europeans just like us and perfectly friendly & welcoming. Whilst I hated living in Qatar for 6 months (it was bloody awful), some of the best ‘local’ aspects were the genuine friendliness of the real Qataris, their arrogance put to one side for a moment. It’s the politicians who are to blame. Great if your Chinese or visiting remote parts of China! Not a single EU, north, Central American hotel at 5000 points on the list I saw yesterday, though I note the inclusion of two Texas hotels above. Pretty poor from IHG who have clearly decided that the Chinese market is what they need to focus on. Last week we had a three night stay at Shinjuku Hilton (cash-paying punter). What a great hotel. Our first time at a Hilton, btw. I loved that Hilton too, they upgraded up to an exec room with a wet room. Hilton Gold gets you treated very well in Asia from my experience. You won’t catch me ever visiting the UAE given recent events. If you aren’t a spy then not sure what the issue is. +1 Luckily it was UAE not some tougher countries where he could have spent years in prison! It’s not like they jail thousands of brits each year for spying. This was a one-off case meaning there was a lot more to the story than what the government and/or media have been saying about it. Whether he was guilty or not, a fair trial is a human right – and I’m generally involved in prosecutions! For fair comparison, what do people see the plus points of visiting? Well it’s not the sightseeing or history/ culture. Nothing to see. I guess it’ll mostly be guaranteed heat & sun out of European season, pool, beach if you look hard, quality international food, decent hotels, souk & shopping, not as far to go as somewhere better such as Thailand. Fwiw I’ve been & would never dream of returning given numerous other superior options. Horrible, stifling place – but if you want a hotel holiday in the sun, fair enough, horses for courses. Astonishingly high quality hotels, guaranteed good weather, world class eating and shopping, short and cheap flights from the UK, excellent beaches, desert adventure trips, exceptionally practical for kids (excellent healthcare, huge hypermarkets selling UK brands of baby milk, nappies etc), silly stuff like the dancing fountains / ski slopes, 100% English speaking. You can begin to add to that world class museums and some decent theatre / opera (eg La Perle in Dubai). You do it once, and that’s it! It is a boring place: you may have the most amazing infrastructure, shopping malls… bla bla bla… but if a place lacks interesting things to do… you go once, and that’s it. And it is also very fake, no charm, no nothing, nada. @Will – I think you might qualify that. Isn’t it mostly sand with a bit of grass thrown in around teeing off & the 18 holes? Thanks I have not been and was curious. @marcw The beauty is in the eye of the beholder. The same applies to “interesting”, so subjective. Raffles – istr you have good family reasons to go, ie visiting the rellies. If those reasons didn’t exist – and you weren’t going for business reasons – would UAE even figure in your holiday destination plans ever again? We went before we had the kids and before the rellies moved. If you only have a week off it is far easier than Asia, say, where you are on Day 3 before the jet lag clears. No reason to go for longer than 5-6 days though. Slightly OT: I need to book a few different hotels in different brands (Hilton, Marriot, IHG) for stays at the end of Jan. When do the chains release their points bonuses for around then? If it’s in the next week or 2 I can hold off from booking. What do you mean by bonuses? Hilton have got a bonus offer on buying points until mid December, I’m not aware if they ever do “sales” of points nights? (It would be great if they did, I have 3 nights in NYC in May and there’s nothing for less than 70,000 per night). I’m guessing he’s meaning the different promos most chains have on? IHG (sometimes) and Accor (almost always) have requirements to book after a certain date but Hilton (and ?Marriott) pretty much always honour them for existing bookings too. That would make sense! I think Hilton might have one at the moment, I recall signing up for something recently. Yes they’re doing double base points just now, although very slow to post after IT merger! You could book something flexible and then rebook if a promotion you like comes along? These two Japanese places (apart from Hiroshima) made me do a lot of googling as I never heard of them before. Now I have a new place on my bucket list for my next trip to Japan – Matsuyama. Matsuyama (and Shikoku) is a nice play for your maybe third/forth trip to Japan. Not many tourists, nice hikes (the most important pilgrimage route is there), onsen, a little bit slow to navigate with public transport though. How about that IC Medellin?